Although the Marine Corps' role in the Pacific War is well documented, the role of the U.S. Army is less well understood. In fact, I can't think of a single video game which has portrayed the U.S. Army in the Pacific War. However, the Army played a major role in what was called the South-West Pacific Theater. Remember, the Allies were driving towards the Philippines from two directions. One was the island-hopping campaign through the Pacific, using the Marines under the command of Admiral Chester Nimitz. The other was in the south-West Pacific under Gen. Douglas MacArthur. MacArthur commanded American and Australian forces in New Guinea, through the Dutch East Indies towards the Philippines. The U.S. Army would take the lead in the initial defense of the Philippines, as well as in New Guinea and the reconquest of the Philippines. Army forces would also play a major role in Burma, in Okinawa, the Bismarck Archipelago, the Aleutians, on Bougainville, on Makin and on Angaur. M1903 Springfield The venerable Springfield was in common use at the start of the Pacific War, and saw heavy combat in the defense of the Philippines. It would later be replaced with the M1 Garand. The M1903 was also the main rifle used by Filipino troops. In addition, Ranger units rejected the Garand and preferred using the M1903 for the duration of the war. The M1903A4 was the sniper variant of the Springfield used by the U.S. Army. The gun was equipped with a 2.2x scope. Enfield M1917 The main American rifle during World War 1, by the outbreak of World War 2, the Enfield M1917 was used only by mortar and artillerymen, and rear echelon troops. Quickly replaced by other weapons, the gun would later be supplied to China. The Enfield fired .30-06 Springfield ammunition. The gun contained a 5-round magazine. Already covered in previous thread. The main rifle of the Army from 1942 onwards. M1 Carbine Also alread covered in a previous thread. Not as common with the Army as with the Marines. The M1A1 was a folding stock version used by paratroopers. The M3 Carbine was an M2 Carbine (M1 with full auto/semi auto capability) which was fitted with an M1 sniper scope and an infared sight, in a manner similar to the German Vampir system. The M3 was used in limited numbers on Okinawa to counter Japanese night infiltrators. M3 Carbine, scope on the bottom and infared night sight on top of the scope. M1 Thompson SMG The .45cal Thompson SMG was far more common in Army units in the first years of the Pacific War than with Marine Corps units. The gun was commonly used in New Guinea and the Solomons. By 1944, the Thompson had been superseded by the M3 "Grease Gun" in Army service. M3 "Grease Gun" The "Grease Gun" was designed as a low cost replacement for the Thompson gun, firing the same .45ACP ammunition. The gun was only effective to around 100 yards range. Costing less than half of a Thompson, around 680,000 M3s were produced from 1943 to 1945. In December 1944 the M3A1 entered service. This gun featured a redesigned cocking assembly and an optional flash hider. A version of the M3A1 with a silencer was used for special operations. BAR 1918 Already covered in a previous thread, the BAR was also popular with Army units in the Pacific. Winchester M1897, Ithaca 37, Winchester M1912 Also already covered. Used in limited numbers. Browning M1917 Machine Gun Already covered. Used throughout the war in smaller numbers than the M1919. The most common medium machine gun of the war. Browning M2 Heavy Machine Gun Although it saw heavy use as an antiaircraft gun, an aircraft gun, and mounted on vehicles, the M2 "Ma Deuce" was not commonly used as a tripod-mounted machine gun in the Pacific due both to its bulk and due to the fact that a prepared M2 position guarding a road intersection (its common use in Europe) could easily be outflanked. Bazookas The Bazooka was used by the US Army in the Pacific for roughly the same purpose as the Marine Corps used them - against bunkers and tanks. They were not deployed in large numbers. The M1A1 entered service in 1943, and the M9 in 1944. M1 Bazooka M1A1 Bazooka. Front hand grip deleted, sights adjusted and provision for a blast shield added. M9 Bazooka adopted in 1944. Tube could be broken down for transport, had a small generator instead of batteries for the electrical firing system, different shoulder piece. Colt M1911 Already mentioned, used by whoever was authorized to carry a pistol. 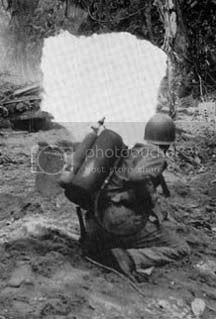 M1 Flamethrower Soldier uses M1 Flamethrower on Bougainville, 1944. The M1 was also used by the Army, for much the same purpose as the Marine Corps. And it would likewise be replaced by the M2-2. Mk II Fragmentation Grenade Used by the Army as well. Also used smoke and white phosphorous grenades. The Army typically wore the standard Army uniform of the war, the same as Army troops in any theater. From late 1942 to early 1943, a one piece jungle suit was issued to Army forces. The pattern was the same as the USMC P42 uniform. The purpose of a one-piece suit was to protect against bugs and thorns. To avoid overheating, soldiers did not wear any underwear while wearing the 1-piece suit. Trouble is, in order to relieve himself a soldier had to take off his entire suit, negating any attempt at insect protection. The suit also became very heavy when wet. This led to the suits being discarded in early 1943. 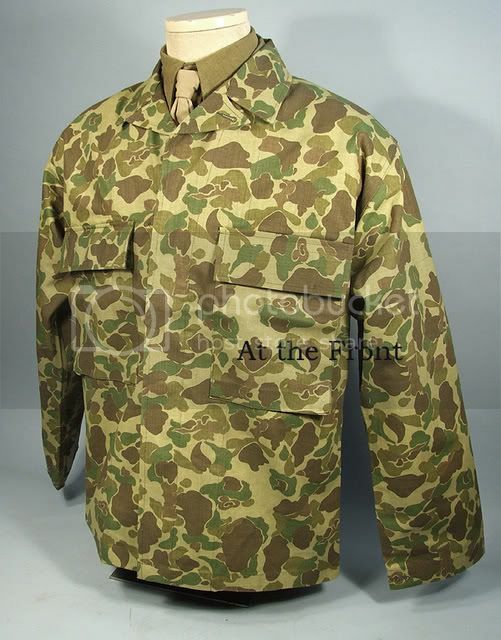 In early 1943, a two piece reversible camouflage uniform similar to the Marine P42 jacket was issued. In 1944, a new version had darker colors. However, it found that it was easier to see a moving camouflaged individual in the jungle than it was a moving olive drab individual. Hence, the camouflage uniforms were largely withdrawn by mid 1944. The U.S. 2nd Armored Division was sent to France wearing jungle camouflage pattern in the summer of 1944. 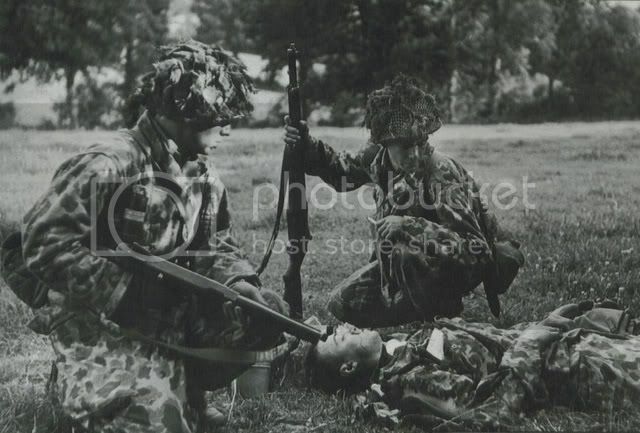 However, the camouflage strongly resembled the Waffen-SS "Oak Leaf" scheme and after several friendly fire incidents the uniforms were quickly withdrawn from service. 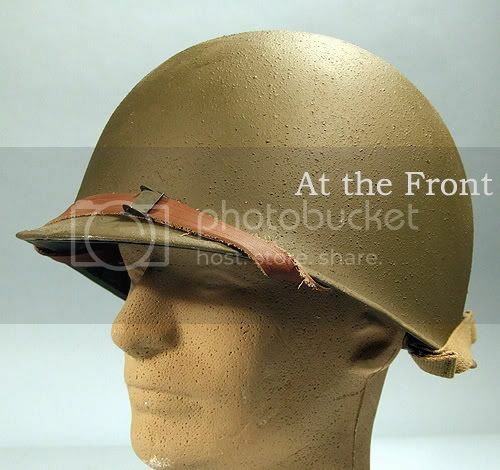 Helmets At the beginning of the war, the U.S. Army was still partially equipped with the M1917 "Brodie" helmet used by British and Commonwealth troops. The M1917 was being phased out at that time, but it was used by Army and Filipino troops in the Philippines and by Marine Corps units at Wake Island and Guam in 1941. 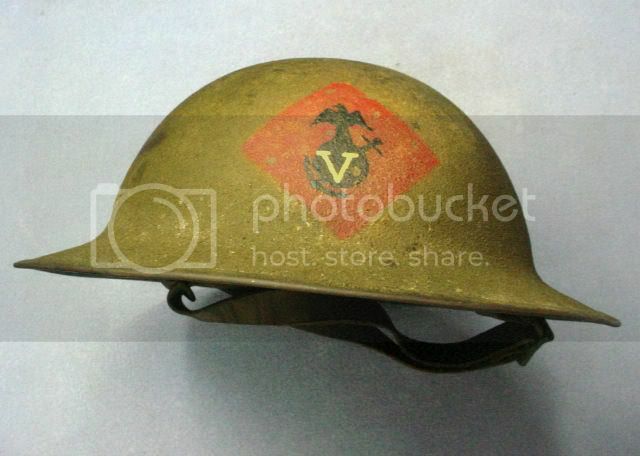 The good old M1 steel helmet replaced the M1917 by mid 1942. The Army never issued helmet covers, only helmet nets to allow the addition of natural camouflage to the helmet. So the USMC never used the grease gun? The Lewis Gun was invented in the United States in 1911 and served in large numbers with British and American forces in World War 1. Largely replaced in American service by World War 2, at the outbreak of the Pacific War the gun was still in service with Filipino units and Marine Corps units in the Philippines. 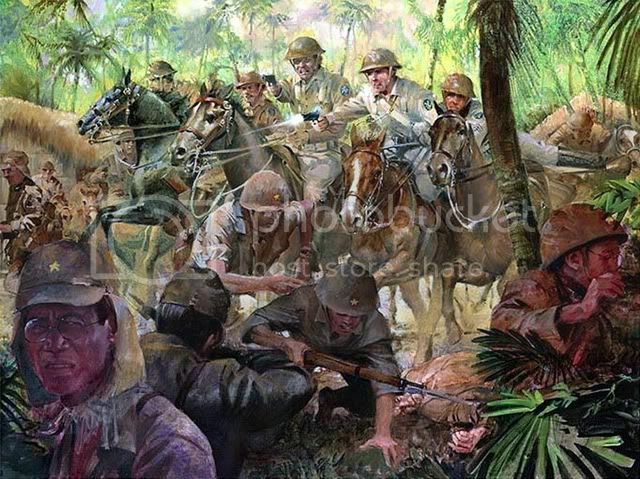 At the beginning of the Pacific War, the US Army still maintained a number of horse cavalry units, including one regiment in the Philippines. 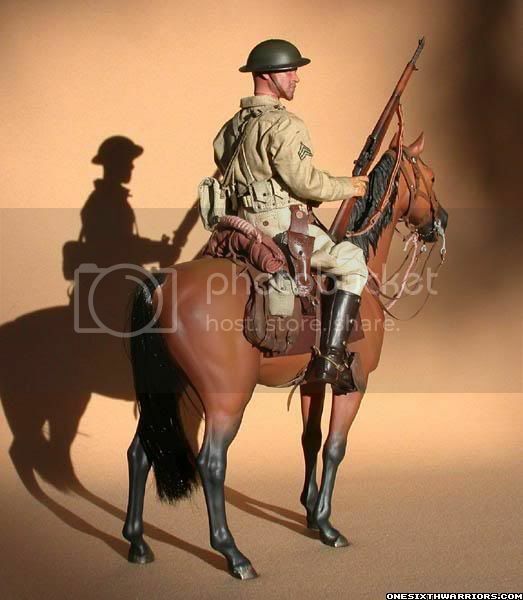 Cavalry sabers had been phased out in 1935. Cavalrymen used the Colt M1911 pistol as a mounted combat weapon. 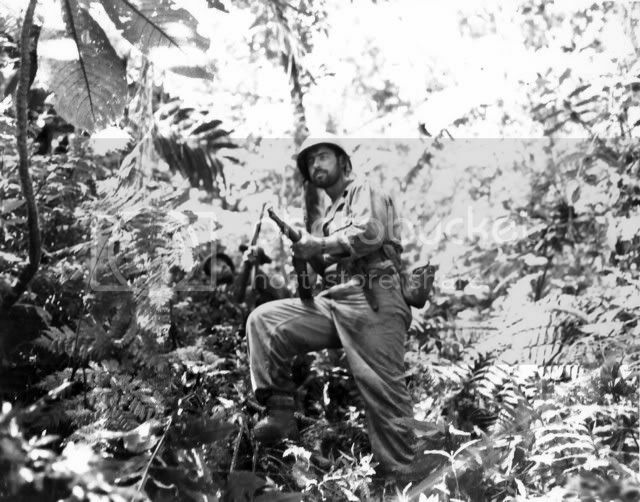 They were also some of the few units in the Philippines to receive the M1 Garand rifle. M1922 Light Machine Gun The M1922 was a version of the BAR 1918 with a ribbed barrel and spiked bipod. 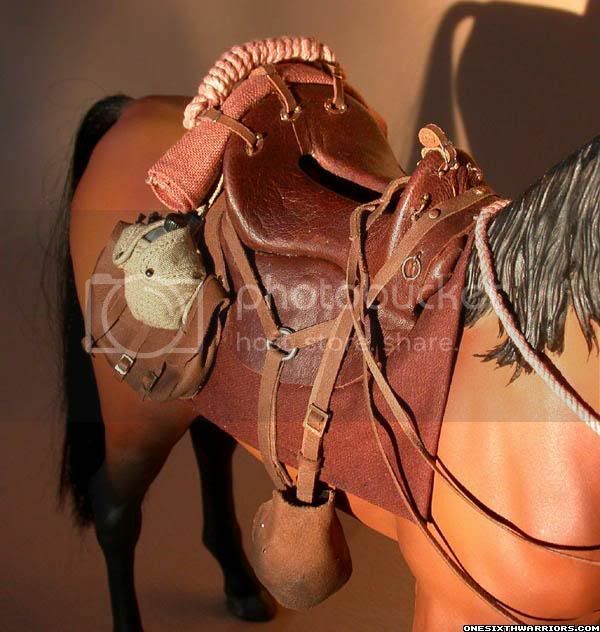 This was used by US cavalry troops. 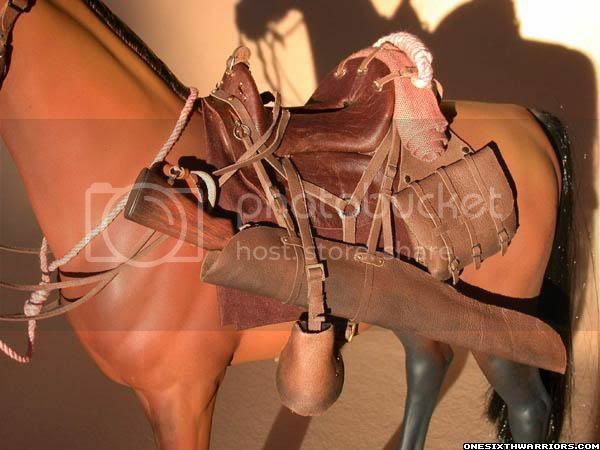 Filipino scout of the 26th Cavalry Regiment McClellan Saddle of the US Cavalry, showing rifle carrying sling. 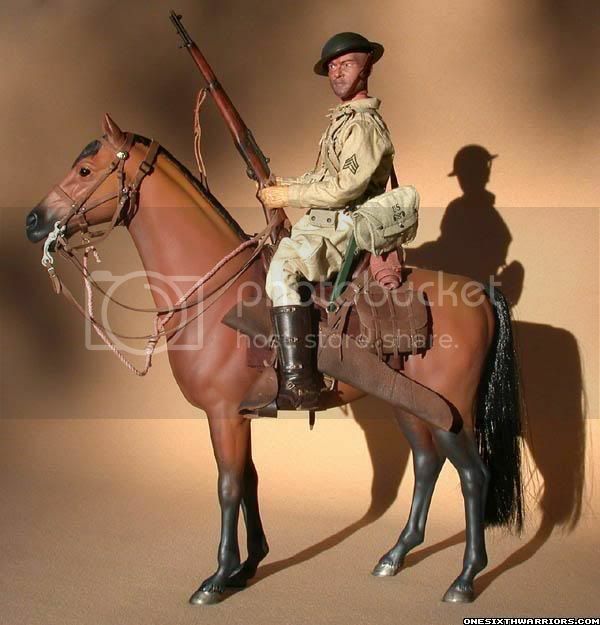 One of these, the 26th Cavalry Regiment, was made up primarily of Filipino troops led by American officers. 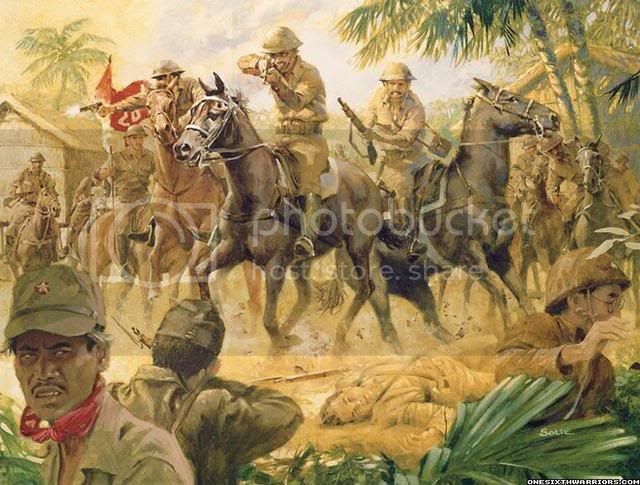 On January 16, 1942 the 26th Regiment executed a cavalry charge against Japanese troops at Morong on the island of Luzon. In the Philippines, Filipino troops were divided into two categories: The Filipino Scouts were attached to US Army units and primarily commanded by US Army officers. These units received weapons and equipment comparable to American units. The second category were the Philippines Army forces. These forces were formed in 1936 with the intention of eventually becoming the Army of the independent Philippines. These units suffered from poor training (some had never fired their weapons before being sent into combat in 1941) and poor equipment. They were usually equipped with M1903 Springfields or M1917 Enfield rifles, as well as World war 1 era Lewis machine guns.